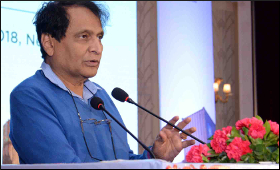 A day after approval of the Agriculture Export Policy 2018 by the Union Cabinet, Commerce Minister Suresh Prabhu urged Indian startups in the field to explore ways for high yield. Speaking at the Start-up India Global Venture Capital Summit on Friday, Prabhu said, "India has a very unique system. Almost all the land used by agriculture is privately owned, very small segmented holdings, and that is why we have an opportunity to increase the yield with a different kind of approach. "There is an opportunity for start-ups. How to make a small holding produce greater yield with new technologies coming in, new support coming in." Prabhu also said that the central government had conducted an extensive gap analysis exercise to enable industry, service and agricultural sectors to achieve more. Also, the National Democratic Alliance government is putting in place new policies and administrative solutions in order to boost growth to a new level. "We have almost done the gap analysis. We have understood the gap that exists for industries not growing to optimum level, services not realising their true potential, agriculture not reaching the height that they deserve to reach and all those gap analysis we have addressed through policy, administrative methods and everything else," Prabhu said.